The two worlds of design and business still need to learn to meet half way. Think of an organization in which design plays a central, driving role, and there’s really only one major cliché of an example to use: Apple. But what Apple has in Steve Jobs is what every organization looking to embrace design as a genuine differentiating factor needs: a business expert who is able to act as a whole hearted champion of the value of design. In other words, Jobs has been utterly convinced that consumers will be prepared to pay a premium for Apple’s products, and so he’s given the design department the responsibility to make sure that every part of every one of those products doesn’t disappoint. He is also notorious for his pickiness. I’ve talked with Apple designers who say he would scrap a project late in the game in order to make sure something is exactly as he thinks it should be. Now I don’t know about you, but how often does a project come back and it’s not quite how you wanted it but it’s ok and it’s really too late to make the changes to make it great and so you go with it? I know I’m guilty of doing that. Jobs doesn’t countenance that approach. And he’s set up processes to ensure that problems are caught, early, and the designers have enough time to get back to the drawing board if necessary. This commitment to excellence has helped turn Apple into the world’s most valuable technology company. Helen – I’m seriously impressed by this post. I head up Fjord’s ‘Business Design’ practice in London and strive hard for a sense of realism about how to get good design to get traction in a business sense. Your post here is full of fantastic insight and hard-nosed realism. I got very carried away in 2007 or so by a lot of the publications that appeared at that time, and I particularly like your way of articulating the need for design as a discipline to make sense within particular organisational cultures and business environments. Hoi Helen, I like your cautious view on design thinking. You mention important points, particularly that change does not happen when you introduce a new process. A fool with a tool is still a fool. But we can learn a lot from the design approach like how to find customer insights and that we should develop lots of options before we later decide which option we should follow. Design Thinking is one of those terms that is easiest (yet not easy) to define by describing what it is NOT. I don’t think it is a new way of thinking. It is rare, but now new. I see it as willingness to lead, and take risks, and change whatever needs to be changed to achieve what you believe to be the desirable outcome. Why it is called design thinking, I’m not sure. I don’t think design has much to do with it. It is creativity and innovation realized. And has always been. Design thinking is just like customer service – a way of thinking that cannot be inserted into a company from the middle, and most certainly not from the front lines. It is always dependent on the leaders’ strength of conviction. If it is just words, it will not stick. Leaders that have changed entire categories, or created new categories — through what is now for some reason called “design thinking” — include Walt Disney, Steve Jobs, George Lucas, Guy Laliberte, John Lasseter, maybe even Henry Ford! All leaders who were and are willing to lead, to champion, to do. Questioning “what is” and asking instead “what if” is the thinking behind it. Designing new processes, new technology, new things, is just one part of the process. Spot on as always, Helen. The unspoken irony is that Design Thinking is overdue to have its own tenets of observation and prototyping pointed upon itself. Time to say, ok, we’ve prototyped this thing, what’s working and what’s not? What’s working (when it works) is teasing out new consumer needs and compelling product solutions. But there’s a baked-in tendency to miss the needs of the business, or even dismiss them. Like any piece of prototyping, Design Thinking’s road test has shown what the next model should do that this one doesn’t. Some of us have already drunk the convergence Kool-Aid where analytics and creative synthesis are joined at the hip, to far greater effect than either alone. Maybe it’s time to pour it around. Thanks so much, all, for your thoughtful comments. @John Oswald, thanks so much! I’m glad this resonated and best of luck with your own practice. @ Patrick Stahler, thanks for the links and for my new favorite phrase, “A fool with a tool is still a fool.” ;) @ Tuija Seipell, seems to me like reframing a problem is at the heart of the design process. And you’re bang on, leaders are critical–the good ones know they can’t delegate the job of creativity to others. @Mark Payne, YES! I’m excited about the next prototype of design thinking and look forward to watching you serve up your wisdom from a larger stage. Great post. It points out the main problem with design thinking – it is not a single thing, yet people throw the phrase around as though they are talking about an agreed-upon entity. 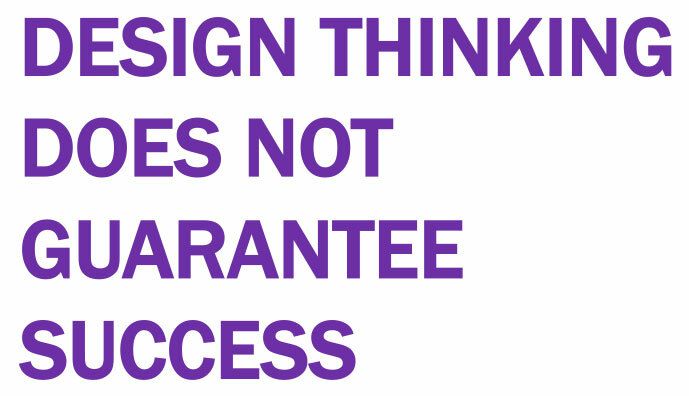 My other problem with design thinking (and I come from a design/sociology/writing/strategy background, so I am a fan of both design and thinking) is that it is something that is neither exclusive to designers nor universally practiced by them. DT is a loosely defined collection of techniques, processes and mindsets – but these can and do exist in other disciplines, and are certainly not universally done by designers. Helen, nice article, but it is really something a lot of us have been discussing for quite some time. I’ve been working to foster design thinking with businesses, gave talks and even supported government lead design initiatives for some time now. In my mind, the real issue here is not the “who” or the “how”. It is more the “why” and the “so what?”. There is a lot of discussion on how to view DT, integrate it, the relationship between design and business, etc., but the real challenge is we need better results and outcomes. The Apple story is rather tired at this point in time. Everyone, including designers need to do a better job with DT. And if we are hoping that more businesses are going to adopt DT, they need to know that it works, and not only in companies like Apple. I agree with you, there can never be 100% success with DT, but success (and “results” as I mentioned above) is how we define it. Us creative types tend to focus on the process, building the team, the problem at hand and the overall experience of doing it, but it is time to focus on the results for a change rather than being fluffy about it all the time. As designers we tend to think only about our users and sometimes forget we are part of the business. Helen, I loved reading this. You do a great job of pointing out the snags we run into as so many of us work to infuse business with more design. Design’s etymology, in fact splits, in modern English into two conflicting pieces: 1. intention (DT) and 2. pattern drawing (design’s serious image problem, as you tweeted yesterday.) I think that as designers need to redefine and publicize design as an intention-oriented practice, where the outcome could be a new compensation structure for employees or an evolution of product formulation or experience just as easily as sleek objects, logos, and pack designs. Religion, government, and business have been practicing design (designation — or the exercising of intention, — which has recently been re-labeled design thinking) for thousands of years, as entities have designed rules and systems for the benefit of themselves. That is, designers need to get used to the fact that businesspeople are designers too. In truth, the elusive results that design thinking and innovation are both looking for lie in fairness and sustainability — without sacrificing profit. We need to design a new generation of organizations and systems, which are truly win-win for EVERYONE and all species on the planet. In accomplishing this shift, designers, as you mention, definitely need to become more business-savvy. May I suggest a goal of educating every designer in business, public policy, and sustainability? A shift of this kind in design education would go a long way toward undoing design’s serious image problem. Indeed, we are not a bunch of effete, air-headed hipsters, whose concerns revolve around ever-evolving notions of what’s cool and what’s beautiful. The emergence of design thinking as a business term is clear evidence that those of us with design backgrounds are ready to help change the world. Pingback: Will Design Thinking Save Us? I do agree with you. Thank you very much for this post. Hi Helen, i really liked the way you have described Design thinking and I could clearly associate with the confusion one undergoes while practicing or being part of a Design thinking process. I have a question in terms of its application… like ‘where should one use Design thinking and where should one not’, any experiences attached to it..
Reblogged this on Design 4. Pingback: Fontblog | Brauchen wir einen Kreativquotienten?